The term “touring bike” used to generate images of grotesque land barges, leisurely oozing along our nation’s highways, deliberately avoiding corners lest the rider be subjected to the two-wheeled equivalent of wrestling a reluctant hippo up a spiral staircase. 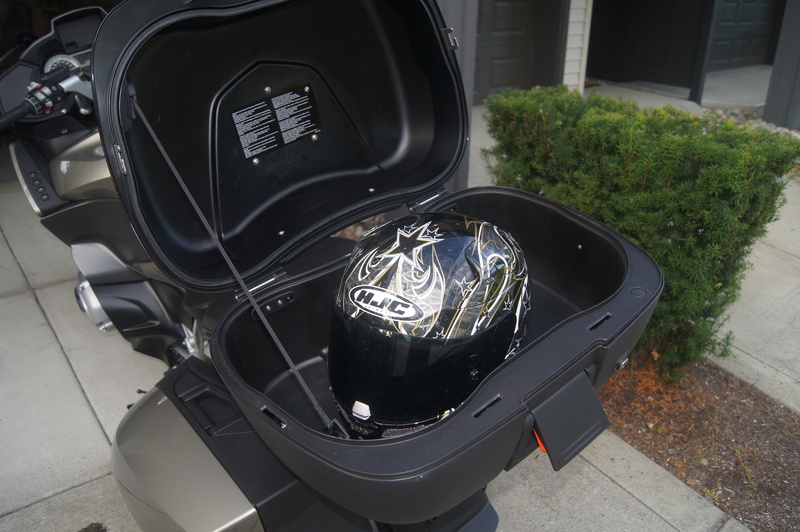 And while there are still motorcycles masquerading as three-bedroom townhouses, many others lean towards the sporty end of the bagger spectrum. 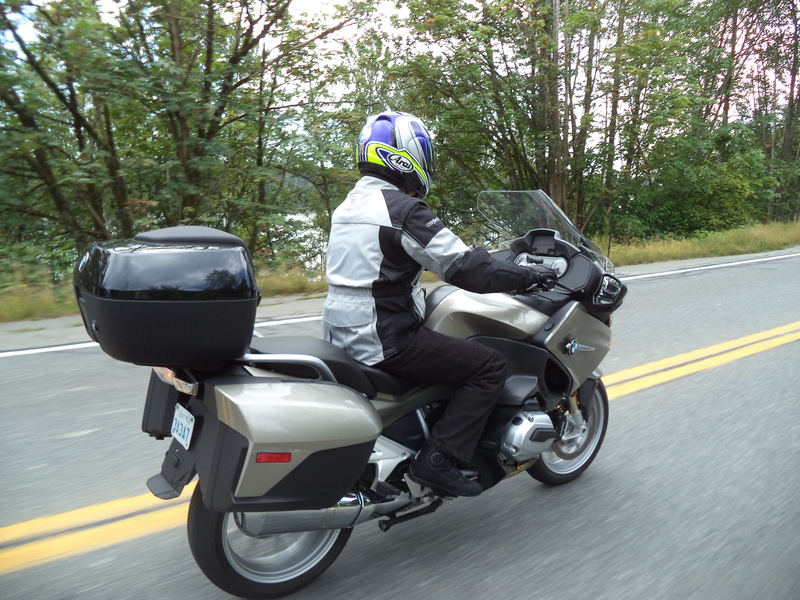 BMW’s R1200RT is one of the latter and, other than a recall in 2014 that actually stopped sales till a potential suspension failure issue was rectified, year after year, it’s been one of the more popular examples of the genre. Yeah yeah – B.C. is beautiful, we know. It’s more beautiful with a Beemer in it, though. Photos by Steve Bond. The RT (base price $21,250) starts with the venerable opposed-twin boxer engine, BMW’s claim to fame since the 1930s. If you’ve seen the latest GS engine, you’ve also seen the RT’s, although a heavier flywheel slows the response slightly and taller overall gearing makes for better highway cruising. A U.S. magazine got 113 horsepower with 82 lbs.-ft. of torque at the back wheel on the dyno – not too shabby. Most significant was that the Boxer makes almost 70 lbs.-ft. of torque at 2,000 rpm and the curve is flat as a dead skunk on the Trans-Canada highway. Nothing says fun like a dead skunk torque curve. Is that a dead skunk? No – it’s a dead skunk torque curve, whipping the BMW swiftly past our hapless photographer. 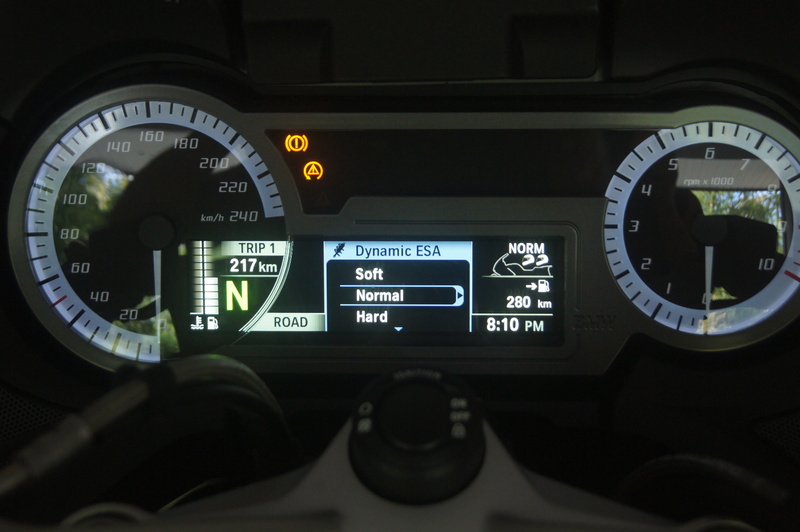 BMW has refined the Electronic Suspension Adjustment (ESA) so that it works really well and the differences between settings are quite noticeable. Around town or wherever the pavement is sketchy, dial in soft, but when the going gets twisty, or you’re loaded down with a passenger and/or luggage, firm it up. And these changes are easily made on the fly. Electronic management allows for three power modes and there’s a pronounced difference between them. 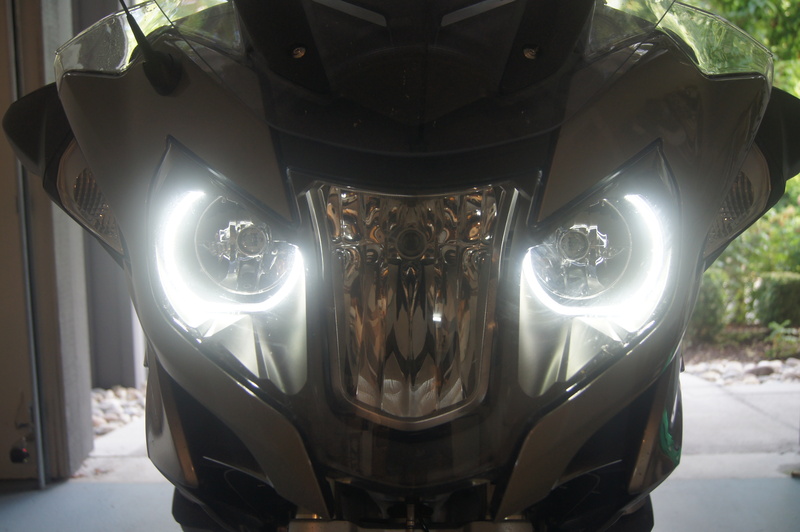 “Road” is normal, with good throttle response and adequate power. “Rain” feels like the airbox is stuffed with dead raccoons and the RT barely gets out of its own way. “Active” really perks things up – throttle response is instant and the RT seems to shed 100 kg. Some like it hard. Others just go soft. But Mr. Bond – he’s Normal, he is, somewhere in the middle. In reality, two power modes are all you need. I found “Active” a little too responsive and abrupt for in-town and heavy traffic situations, but great on the open road. The RT has traction control, so there’s really no need for a “Rain” mode. Also, when you pop into “Active,” it automatically adjusts the suspension to “Sport,” which is fine for smooth western roads but those on Ontario’s rutted cart paths might not like that particular feature. The 25-litre fuel tank gives a range of well over 400 kilometres before you have to look for a petroleum extortion facility, as I averaged better than 5L/100 km with several tanksfull over a variety of conditions, including strafing some pretty impressive mountain roads. Oooh – those brakes look like they can handle some strafing. Wind and weather protection is first-rate and enhanced by an electrically adjustable screen that fits even those above six feet tall. The seat height is adjustable over two positions (805 or 825mm for the standard seat), but “low” and “tall” seats are also available, giving a total available range from 760 to 850mm. Both rider and passenger seats are heated and of course, heated grips are fitted. The factory colour-matched hard bags and topbox hold lots of stuff (the topbox alone is 49 litres) and other manufacturers take note – these are the way bags should be, so everyone just copy BMW. They’re easy to open, easy to remove and install on the bike, lockable, good looking and one key fits all – nothing else required. Plenty of space in there for even the largest of lids. Still strafing, and dead skunking for the photographer. It’s no soggy bun once the road gets twisty, either. The boxer’s low centre of gravity makes the RT feel very light and non-intimidating. It’s not exactly “flickable,” and the Telelever front suspension doesn’t react well to trail-braking, but once you adapt to what’s under you, you can really hustle the RT around the bends. My press unit felt a little squirrely at first and for the life of me, I don’t know why. I checked tire pressures (which were fine), looked at the rubber and there was no cupping or anything obvious, but for the first few days, I just didn’t feel confident at anything above a rather sedate and leisurely pace. Halfway through my first day trip, the handling suddenly came in, the RT felt secure and planted and I could rail through the twisties like on previous RTs. I’ve no idea what changed to make this happen. Weird for sure. My first major jaunt was up the Fraser Canyon to our lunch stop in Spence’s Bridge at a place that must be the local biker bar at night, judging from the Easy Rider decor and the black, streaky residue from numerous burnouts in the entranceway. Good cheeseburgers though. The ride from Hope to Spence’s Bridge shows the diversity of British Columbia as you traverse from coastal rain forest to high desert terrain that’s reminiscent of California with rolling brown hills. From there it was down the wonderful Nicola Highway, to Merrit, a short blast down the 120 km/h (this is me not rubbing it in again) Coquihalla Highway, then the 5A to Princeton, west to Hope and then home. A few days later, I crossed into the US of A at Sumas, just south of Abbotsford, B.C., and wended my way through various backroads to the oddly named town of Sedro-Wooley (which used to be named “Bugs” because of the mosquitoes, and no I wasn’t in Winnipeg), where I picked up 20 or the North Cascades Highway. The west coast really does have a surfeit of gorgeous scenery. I’ve had the pleasure to ride a lot of great roads around the world and the 200 kilometres of the 20 from Bugs to Winthrop ranks right up there with any of them. 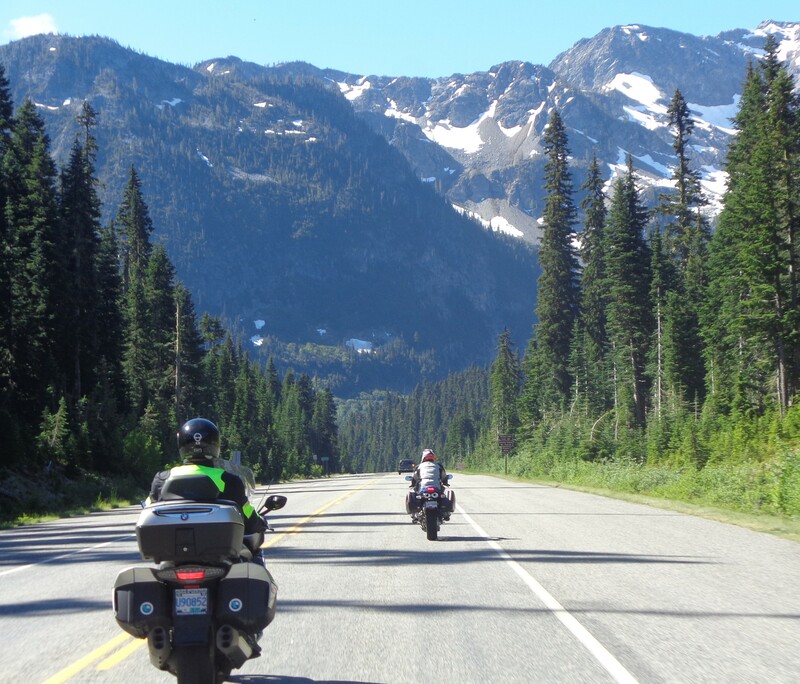 The scenery is spectacular, and the curves are many and varied with lots of passing zones. It’s the law in Washington that if a someone is holding up more than four vehicles, they must pull over and let others pass. Harley riders take note. Not that you’ll be stuck behind lumbering motorhomes or RVs for very long on the RT. 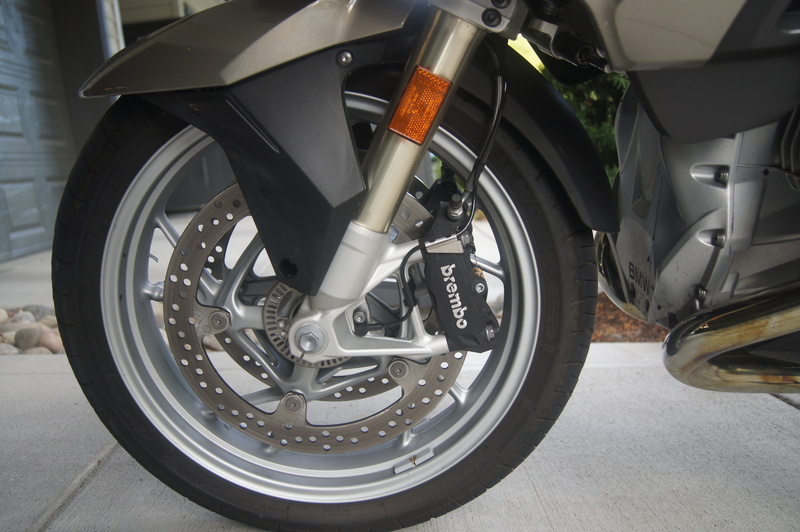 The ample torque allows you to zip by quickly and safely and most times, a downshift isn’t even required. After lunch in Winthrop, a quaint western-styled town complete with wooden sidewalks, I steered the ship for home and got to do it all over again in reverse. At the end of both 700-km-plus days, I wasn’t fatigued in the least. The upright, comfortable seating position, well-engineered seat-to-pegs-to-bars relationship, and exceptional wind and weather protection allowed me to arrive home, cheerful and well-rested, rather than grumpy and sullen as on some motorcycles. The RT has successfully enshrined its place as not only one of the best BMWs available, it’s one of the best sport-touring motorcycles on the market. I also agree with the writers findings. I have a 2012 RT bought new and have put on 75000 km . 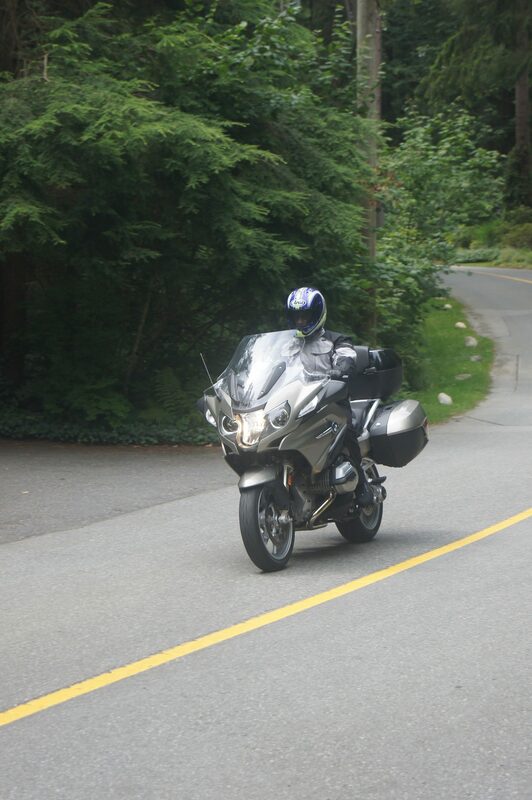 Last ride was a 10000 km loop from TO to Kelowna Bueatiful Cloumbia. Having owned Honda St ‘s and other sport tourers IMHO the BMW is the best sport tourer on the market. Comfort ,handling,braking,weather protection and on. I thought it was a good review and very accurate. I have no bias toward any manufacturer and have owned multiple bikes from multiple builders. Every person will buy what suits them and I bought a 2010 RT used for 12 grand, after extensive research. I think buying this bike new is great if you are wealthy, otherwise buy a good used bike. This is no different than any of those fast and expensive bikes mentioned. As a one bike solution it is perfect for me. The bike can be set on the fly to be relaxed and then adjusted to be an awesome sporty bike, good enough for me to have a blast in the curves. 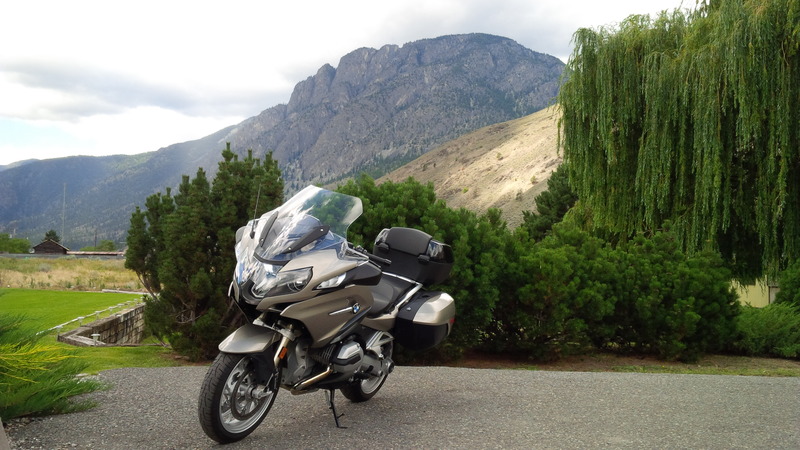 I ride for the twisties but that involves a long ride from Calgary to the BC interior. I don’t think any Beemer is “cheap”, nor is any high end bike. In one year I have done 20 K km, through all conditions except snow. I love this bike. Every other bike had me looking for the next bike, now I am done looking. Perfect for me. As was said, do your research and buy the bike that suits you, not complicated. For the speed guy, my cousin has a Concours 1400. I blast him in the corners, he blasts me on the straights, although I am easy to 200 kph, to each their own. I am done with chains so that narrows the choices, no regrets from me. Fantastic bike, totally awesome. I would like to own this bike, being a KLR owner anything over 100hp is gonna feel like a rocket, but with only one dealer in Nfld, on the east side of the island, 7 hours from where I live, I can’t see that happening. And I watched a video on replacing the clutch…yikes, tear the bike apart will ya! But it still makes me stare, I like very much. Heated seat, grips, adjustable windscreen, make short work of the cooler climate here in the east. Since you watched that video, BMW has completely re-engineered that motor. Opposed twin it still is however its now liquid cooled and it now has a wet, multi-plate slipper clutch accessed through the front engine cover. Should you need to change the plates, its no bigger a job than say, on a Kawasaki Concours 1400 – maybe easier. But more to your point, being far from a dealer shouldn’t deter you from ANY bike you want to buy. If its something you really desire, then do yourself a favour and get it. The article might have been just useful and informative, if not saddled with cheap shots at Harleys (and Goldwings?). I regularly all kinds of BMWs and even sports bikes on my Heritage Softail, a bike not known for its spectacular lean angles. How you ride is personal, and no direct function of what you ride. In short, grow up! Nothing “sport” about only 113hp. Great bike but it’s a touring bike, though I know Cycle World and the like also calls it sport touring. Also I heard the top case is close to $2Gs and that’s without color matching…geez! Not all that long ago 120hp was what one got with a full-on sport bike. But its torque that counts and, as indicated in the write-up, there’s 80 ft. lb of that available early on. And the top box price is $581.00 not $2,000…geez! Well Blackie if by “not that long ago” you mean almost two decades ago, then yes, though those bikes were about 200 pounds lighter than the RT. And if it’s “torque that counts”, my stock twin cam 96 puts out 86 ft. lbs. at the wheel so it must really fly (it doesn’t)! And speaking as someone who’s lost a BMW hard bag (damn thing flew off over some bad bumps), there’s no way a new OE BMW bag cost that little. Actually just checked – the bag pictured on Bondo’s bike is a $1500 option on a new RT before tax, more if you buy it as a stand alone. But like I said, great bike, just not a sport-touer IMO when so many other bikes that you can do serious distance on are doing 160hp + at the crank like the Multistrada, KTM’s GT or BMW’s own GTL1600. Regarding your stock twin cam, the sixty foot times on that bike bike are excellent if properly ridden. Quickly running out of rpm is its hindrance to higher performance. Regarding the price of the top box – remind me not to shop where you buy yours. More than one place quoted me $581.00. yeah, nice review but what is the cost of ownership and long term reliability?? not everybody change their bike every 3 years…. True, what does the first service cost and I’m also wondering how much to replace the shocks when they someday give up the ghost. I own a 2014 GS and haven’t found the ” cost of ownership” a big deal. Just got a 10,000 Km check done $200 with oil change and tax. Replacing shocks? well most bikes are coming with electronically adjustable suspension so I guess it will cost about the same as others. BMW biggest problem is a lack of dealer network. In Ontario you have several in T.O. and then nothing till Winnipeg, that’s a huge stretch of screw you, you’re on your own. To Jimo and Ben. Nobody, not even the US mags get to ride press bikes for three years. The only place you get that type of information is from owners forums on the Net. If you’re really interested in something, do your research, as I did with my latest purchase.